I have been waiting for this place to open for over a year now. Their original launch date was Fall 2009 but I guess unexpected issues caused delays in opening. 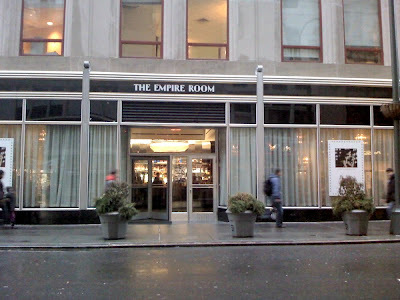 The Empire room is located on 33rd street between Fifth avenue and Broadway. For those of you are familiar with the area, you'll know that this is where the old post office used to be and it is huge. Main attention at this place is the bar. As you as you enter you are right there. It seems like person behind the Empire Room is the same person behind the famous Campbell Apartment in the Grand Central Station. It has a classy old feel to it. You can certainly see the similar 1920 Art Deco details from the Empire State Building with wall decorations, chandeliers, fancy furniture, etc. This is an upscale establishment with well made drinks and prices to match. They do make one hell of a dirty martini and I'll be back again to try few more, hopefully someone will treat me next time. There were some snack options but that's for the next time.